Developed from the ground-up by Savaria to fill a gap in commercial transportation needs, the lowered floor conversion for Ram ProMaster is a simple, yet flexible solution. An innovative in-floor manual ramp means there is no hydraulic lift or electronics that require service or maintenance and no chance of breakdowns that can strand passengers inside the vehicle. Transport both ambulatory and wheelchair passengers with room for up to 8 passengers, including 3 wheelchair positions. Keep operational costs low with this front wheel drive vehicle featuring good fuel economy and easy maneuverability. 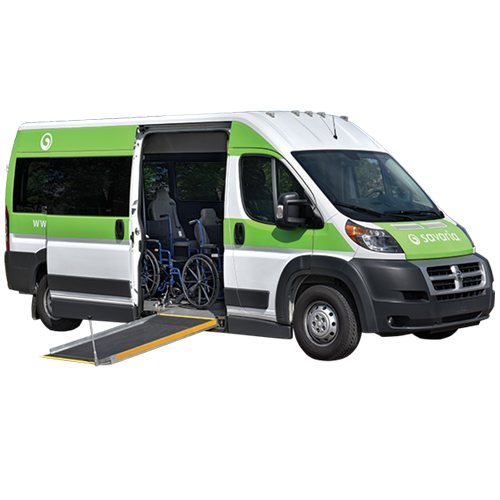 This vehicle is ideal for retirement homes, long term care centres and municipal needs where transit is needed for wheelchair passengers, or people with other mobility devices along with fully ambulatory passengers.